and humble and gentle in victory. a son who will know thee and that to know himself is the foundation stone of knowledge. but under the stress and spur of difficulties and challenge. here let him learn compassion for those who fail. one who will reach into the future, yet never forget the past. so that he may always be serious, yet never take himself too seriously. greatness, the open mind of true wisdom, the meekness of true strength. 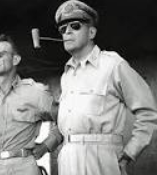 Douglas MacArthur, an Army General and Medal of Honor recipient in World War II, was father to one son, Arthur IV. This entry was posted in Parents and Parenting, Words of Wisdom and tagged father. Bookmark the permalink. This is lovely. Thanks for sharing it!